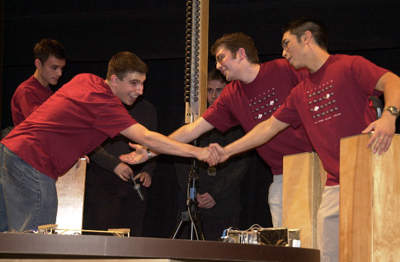 The object of this year's contest is to design and build a device which, in collaboration with a teammate's device, will move a cage assembly from the center of a square table into a team scoring zone. At the start of the contest, the teams' devices are located inside the cage. In each contest, each device will strive to combine speed, strength, creativity, finesse, guile, strategy, etc., to complement and assist its teammate's device in out-performing the opposing team's devices.